Well Earth day and Arbor day sort of sneak up on me every year. I have grand thoughts on what I would like to do with they boys and then boom..it’s over and I feel bad. But what I gently reminded myself this year, is that Earth and Arbor day are everyday. And just because I may not do some grand gesture on those two days with the boys does not make me a bad person. Because it’s more than two days and my commitment to my garden throughout the year as well as supporting the local wildlife (bees and birds) demonstrate my commitment to the earth. It’s not about a symbolic planting of a tree on the designated day (although that is a nice activity). It’s about our daily connection to the earth. That’s what matters and I know I have that and my boys witness my love for it regularly. 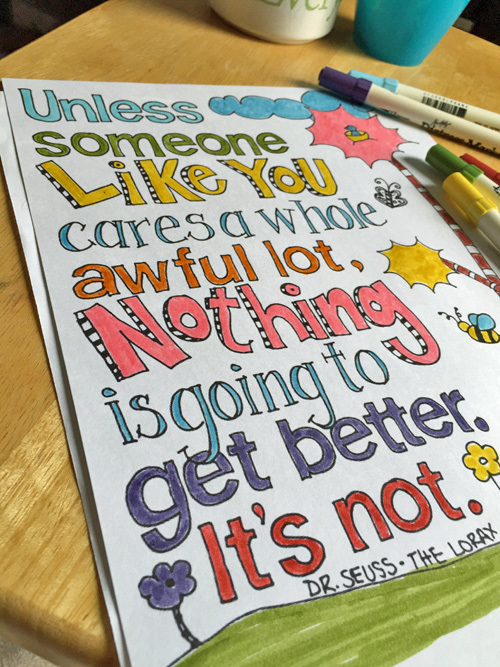 That said, I did not plant a tree on Arbor day but I did color this lovely free printable of a quote from Dr. Seus’s Lorax. 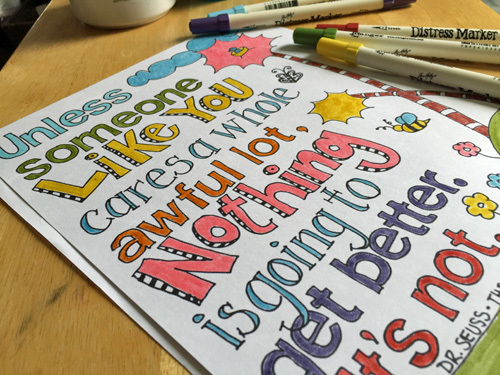 I used my distress markers for a change up and now I have a little poster to hang in my craft room. So if you were feeling down about not doing an activity on the designated day…don’t. Make it a new habit everyday to spend a little time in nature to find your true connection. It might be a flower garden, or a vegetable garden or maybe it’s just supporting wildlife (birds) with a feeder and starting a bird watching practice daily for a few minutes each day. My boys always tease me because I put my good camera near the door and daily spend time watching my feeders and yard for bird interactions and new birds. If I’m lucky I see cool things and if it’s a special day, I actually capture it on film. But their teasing let’s me know they are aware of my connection and I hope one day, they too will find theirs.